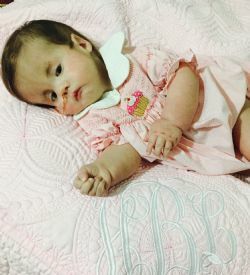 Hartley Louise Brabner, was born December 30, 2017 with full Trisomy 18. She gained her angel wings on February 5, 2019. At 4 lbs.15 oz, Hartley came into this world with a purpose. She had a mission that began before she was born and will continue well into the future. Hartley was sent here to inspire. Many have told us that we have inspired them throughout this journey, but we don’t think that is entirely true. We were just parents trying to do what was best for our baby girl. She was always our inspiration. She made us strive to be better parents, to be a better family, to be better Christians, and to just be better people. The way she touched the lives of so many people without ever uttering a word is truly amazing. We were blessed with an inspiring, love filled 402 days. Hartley is survived by her parents, Mr. and Mrs. George Reynolds Brabner, IV (Lindsey and Reynolds), two siblings, Holden Reynolds Brabner and Harper Ann Brabner, grandparents Mr. and Mrs. George Reynolds Brabner, III (Rennie and Mary Ann), and Mr. and Mrs. Vernon Thomas Ankersen (Vernon and Mary Lou), aunts and uncles, (Mr. and Mrs. Clayton Joseph Ratledge (Clay and Laura), Mr. and Mrs. Jeremy Vernon Ankersen (Jeremy and Leigh), and Mr. and Mrs. Corey Thomas Ankersen (Corey and Lexi), first cousins, Emma Grace Brabner, Camille and Audrey Ratledge, Kaitlyn, Blake, and Jackson Ankersen and Bennett and Corbin Ankersen, and many other aunts uncles, cousins, family friends, and Hartley’s favorite pet, Tanner. Visitation will be Friday, February 8, 2019 from 9 am to 10 am at the Cathedral-Basilica of the Immaculate Conception followed by Mass of Christian Burial and internment at Mobile Memorial Gardens. Family wishes to thank the doctors and nurses in the NICU and PICU of USA Children’s and Women’s Hospital for their dedication and hard work, with a very special thanks to Rene Sprague, RN, Founder and Coordinator of the Bridge Program at Children’s and Women’s. In lieu of flowers, the family ask that memorials be made in Hartley’s name to the Bridge Program at USA Children’s and Women’s Hospital. A church service will be held at 10am on Friday, 02/08/2019 from Cathedral-Basilica of the Immaculate Conception, followed by a committal service at the grave site. Praying for all the family. Your loss is Heavens gain. Beautiful little angel.